Home / Business & Investment News / Words Cant Say Enough – Wow Profits! Market just did it again and nailed another target that had a $2-$4 profit per share move depending when you got in, IF you got in. I should not these are trade ideas for intraday/momentum traders but just look at the potential gains that can be made in 24-48 hours when they occur! I sent this spike alert out on Feb 23rd after hours, market opened sharply lower the next day and all indicators were screaming buy also… Gotta love it! 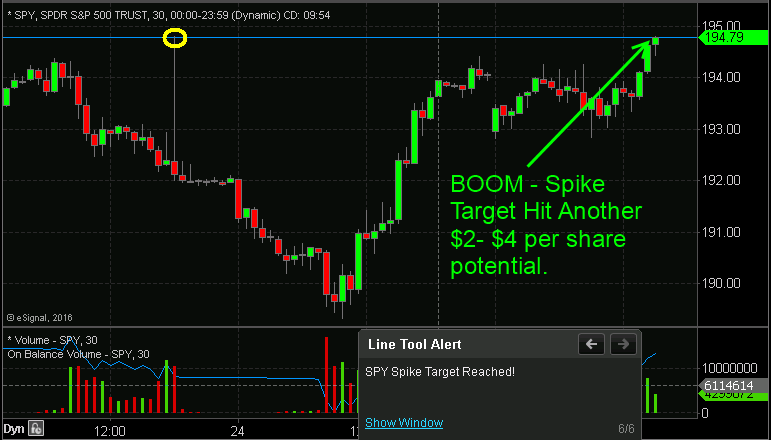 The SP500 hit our spike target this afternoon for a potential $4 per share move in SPY in just 2 days – that is huge. Gold started to rise but has not yet reached the spike target. If the market were to do what I think it will tomorrow. we see stocks move higher in the morning then roll over and sell off to start its decent to the downside spike target. If that happens then we should see gold rally in the afternoon and tag its upside spike target I shared with you this morning. The post Words Cant Say Enough – Wow Profits! appeared first on ETF Forecasts, Swing Trades & Long Term Investing Signals. Gold Spike Reached Target! – Cha-Ching!